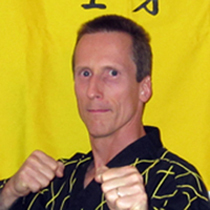 Grand Master Kevin M. Janisse has spent over 35 years in the martial arts starting with Tae Kwon Do , Kun Tao, Boxing, and Kuk Sool Won. He then later moved his focus of study to the art of Kong Shin Bup (KSB) Hap Ki Do under the tutelage of Grandmaster Rudy Timmerman. He has continued as GM Timmeman’s student for over 30 years and as a result of his hard work and loyalty he inherited the art of KSB. GM Janisse has had the privileged to share the art of KSB with martial artists in many countries throughout the world. In 1994 Kevin developed a training program incorporating passive restraining techniques for the Charlevoix TMI Staff to help them deal with aggressive, mentally impaired adults. He received a letter of commendation from the staff in regarding his ability to teach and respond to their needs. In 1999 he released his home study program which is a comprehensive step by step video series designed to help those who do not have access to a local instructor that teaches Hap Ki Do. Throughout his career he has earned over a hundred gold medals, 6 grand championships and has placed in two world championships. He continues to compete today because he believes it helps to sharpen his skills as a martial artist and expose the art of KSB to others. GM Janisse is the President of Kong Shin Bup International and holds to the ideal that a black belt is something you earn through hard work and understanding. He has received recognition awards such as Black Belt of the Year, Instructor of the year, and NKMAA director of the year. GM Janisse continually devotes time to bridging the gap between martial arts styles and believes in the “open mind” principle of first being a student who willing to learn from anyone and then a teacher willing to teach anyone. He has trained under notable teachers such as Ji, Han Jae – Al Docoscos – Hwang, Kwan Sung – Suh, In Hyuck – Seo, In Sun – Patrick MacCarthy – Rick Moneymaker – Ken MacKenzie. He holds degrees in Engineering, Business, Theology, and is a fully ordained Christian Minister who often donates his time to help others with their struggles.